Throw away the traditional paper sticky notes and start using the completely free Efficient Sticky Notes! "Stick" your notes on the desktop and you can read important info at any time on the screen. And you can sync data across PCs and mobile phones. Throw away the traditional paper sticky notes and start using the powerful Efficient Sticky Notes Pro! "Stick" your notes on the desktop and you can read important info at any time on the screen. And you can sync data across PC and mobile phone. Throw away the traditional paper sticky notes and start using the completely free Efficient Sticky Notes! "Stick" your notes on the desktop and you can read important info at any time on the screen.And you can sync data across PCs and mobile pone. 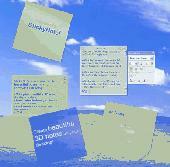 Two Notes is a handy and easy to use desktop sticky notes program for home and office. It has user-friendly interface. Stick notes on your computer desktop as a visual reminder. Get powerful tools for daily organizing tasks with RBO. More than just the usual Calendar, Reminder, To-Do, Sticky Notes, Expenses Tracking and Address Book. Quick launch your email, web browser or any other programs with one click on your mouse! Take Notes & Set Reminder, and Read & Write your note Anywhere in PC by innovative way. FREE, easy to use sticky notes for your PC -- great for desktop reminders, Simple, yet cool notes that roll up and roll down, control them individually or all at once. Free Sticky Notes (free stickies software) is a great tool to organize information or just write down ideas and thoughts. Sticky notes organizer that offers you an easy way to keep all information you have to remember on the computer desktop.